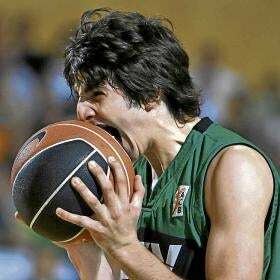 The ping-pong balls have barely settled, and already Ricky Rubio, the mopheaded Spaniard who reminds everyone of Pistol Pete if Pistol Pete had discovered the defensive crouch, is strongarming teams in the NBA draft. "Rubio doesn't want to go to Memphis, and he especially does not want to pay money out of his own pocket with that huge buyout for the honor of doing so. Fegan [Rubio's agent] wants him in L.A., and if he can't have him there, he wants him in Sacramento. Definitely not Oklahoma City. " Fegan, you might remember, was the guy who in 2007 tried to leverage age-fudger Yi Jianlian into a major market, a plan that went down in flames but allowed Yi the luxury of quietly disappointing people in Milwaukee instead of loudly busting elsewhere. Rubio, as Givony notes, has the option of staying in Spain. This is a perfectly acceptable alternative these days — it'll be interesting to see if the growing viability of the international game loosens up something as flagrantly labor-unfriendly as the NBA draft — but it'd be a huge disappointment to those of us tired of watching low-res YouTube clips in which Rubio appears to be playing basketball in an airport smoking lounge.